I have a spinner of cities with default value "Other City". If the user can't find his city, when he selects Other City, a textInput (Your city) is shown. When the user enters his city name there and Clicks the button Register, the getText().toString() doesn't return the value. And also when the field is empty even though I have written validation code, it doesn't work. I have tried debugging by using Logcat, the output is here for the time when the user enters 'my city' in the text input. I'm designing a game engine that is supposed to be overridden. I have, for example, a class called Character. Should I prefix this with BaseCharacter or should I expect that whoever uses the framework prefixes their classes with GameNameCharacter or CharacterGameName? What are the benefits of aggregating a structure and functions associated with it in one object? What are the benefits of explicitly decalring a class. If i write procedural code i already know that some functions are working with specific structures. I just work with it and that's all. For me the only benefit of OOP syntax is that it allows autocompletion tools to show me the list of methods. By the way, I noticed that I can't imagine to work without autocompletion tool like Intellisence. If I turn Intellisence off the main productivity bounty of OOP are going away and i should remember all signatures of public functions. I feel like i'm writing the same procedural code like if i'm not declared class explicitly. Assume you have a library in which every function is public. Sooner or later developers who use your library will come up with a stable pattern of usage. In that terms external information of how developers are using you library already defines the public interface. If your function is dealing with only inner context of library user will not use it. User will feel that in the library there are some other functions that allow him to do his task in a more convinient manner. Why should a user use an internal function if this fuction doesn't touch his context? If the user of the library want to call the internal function that touches his context but this function is encapsulated who said that it was a right decision to make it encapsulated. User context “knows” better what should be encapsulated. Even if the user of the library is messing with internals who said that it will lead to unmaintainability. On the next iteration developer will refactor the code and will come up with the proper maintainable call. For example if you have age field and getAge() method I will use getAge() because I understand that using age field is not maintainable. By the way that doesn’t mean that getAge() is maintainable. May be operating with the field is more simple and clean than with the getAge() method. All of this stuff you can’t predict because you look at your library inside(internally) and not externally (just because you have no information of usage). If you write your own library that doesn’t mean that you know better how to use it. If you make something private that means that you define a pattern of usage (you say to developers: “Use this, not this”). But how you can define a pattern of usage if you don’t have enough information about user needs and context? Who said that some private function should be private? Interface of the library should be defined by a user not by the creator. And user defines it by pattern of usage. Why can't you make everything public and let the user define what should be used and how and what should not? User context “knows” better what should be encapsulated and user code already “encapsulates” your library by the practice of using. So what's the purpose of explicit encapsulation? So I've found this new API called the Screen Capture API and tried it on my desktop. I then tried the demo on Safari on ios, but unfortunately, the API doesn't seem to be implemented yet. Is this API going to be added for ios Safari any time soon? Why does firebase fetch function duplicate so to speak items it is retrieving? I have the bellow firebase fetch method. The problem is that it will double values for no reason. So for example if in the first "loop" the value is media1 then in the next loop it will also say media1 even though at the point of this node there is only one thing... media1. My solution as seen above does not seem to work. Why is there a difference between collectionView flowLayout's itemSize and sizeForItemAt with a navigation bar? I have a UICollectionView that is anchored to my viewController, I made each collectionViewCell take up the width and height of the view. In my collectionViewCell, I have a view that has a fixed inset on each side. When I don't call sizeForItemAt and only use my flowLayout's itemSize (which is set to view.frame.size or collectionView.frame.size), the top and bottom seem to be cut off somehow; however, when I call both itemSize AND sizeForItemAt, the inset is uniform on each side and the cell isn't cut off. All my cells are the same height and width (no heights are changing), so based on this answer, I thought I would only need itemSize (The docs say that when you don't call sizeForItemAt, it automatically uses and makes all cell sizes itemSize). I've tried making navigation bar translucent, making content adjustment insets equal to false, etc etc. the problem is , in java I can easily access the context and use findViewById to get my view , Buy I can't do it in kotlin and it couldn't find the view . How can I access a view in a non activity class? When using Terraform instead of Cloudformation on AWS, I usually get immediate feedback on the terminal, which makes the work very productive. With CloudFormation, however, I tend to edit the file in my computer, upload it to Cloudformation console on AWS, and keep watching until I get an error/success. Even using CI/CD is not much of an advantage, as the result is usually ROLLBACK_COMPLETE, and I have to go to the console to see what went wrong. I'm I following the right workflow for Cloudformation? Should I be doing things differently? I am making an animation in an activity and when the user completes the activity I want to store the seconds (i.e. the amount of time a user uses the animation for) and the date in separate fields in Firestore. However, the user can perform the activity several times a day so I want the seconds to add up as this happens on a particular date. So in simple terms I want to store the elapsedSeconds and date variables in firebase - firestore. However, if the date is the same then I would like to add up the elapsedSeconds in the database (meaning if the user performs the animation multiple times a day). My android app is not moving to the next screen when I request it to. I have reviewed my code over and over for an hour, I've cleaned it and rebuilt it and I've synced it. EDIT !! This is what my LoginActivity file looks like. When I click the register link it says that my app has stopped. I just tried this and I am still getting the same error. Screenshot of the item selection issue is the following. The only problem I am facing is the auto selection of unanswered options. 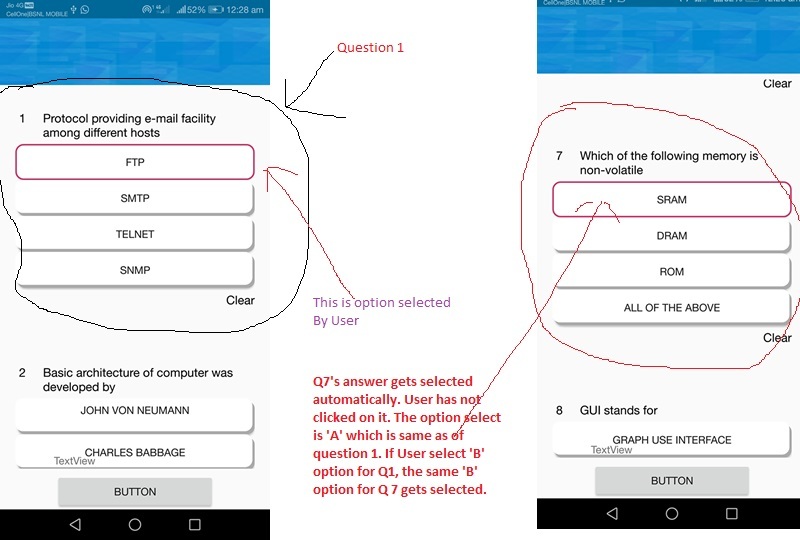 Please help me out in selecting the selected option only not the ones which are not selected. Thanks in advance. Can i remove 'layout_behavior' from 'View Pager' inside 'Coordinator Layout'? I'm setting up a new Tabbed Activity in Android Studio and found an error on 'layout_behavior'. Can I just remove it? Is there any deference if I just remove it? I am trying to implement the Translator Text API in an Android app. When trying to implement it into mine, I get a service not bound error so I thought that I would try the sample app that they provided, the link is below. However, when I run this app in my Android Studio and click the button in the app to bind service, it will not bind still. I do not know much about Android Studio and have no idea how to fix this problem, but I think that it should work in something as simple as the sample they provide. I was wondering, I"m looking to add update button in my fragment which when user click will check if updates available or not . I"m looking for solution on How to acess json file from url and check if json value contains new value or not . if key matches to the already specified value then display message you data has been updated and if not then display No updates availaible. and if it contains other then 1 then show toast message with updates availaible.